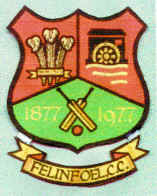 Welcome to the Play-Cricket website for the Felinfoel Cricket Club. The club's 1st XI play in Division two of the South Wales Cricket Association, while the 2nd XI play in Division five. Both teams won their respective championships in 2016. Prior to the re-organisation of the SWCA in 2015 our 2nd XI won the Division 4 2nd XI Championship in 2013 & 2014 under the captaincy of Anthony Griffiths. The club plays at the Felinfoel Recreation Ground which we share with the village rugby & football teams. Our President is Phil Bennett, OBE, the former Llanelli, Wales, British Lions & Barbarians outside half who played for the club for many years. We welcome new players to the club - just contact one of the officials. Before you can play for the club you will have to be registered with the league but the process is done quickly.